A high percentage of our Winer Triangular Picnic Tables are sold to commercial environments like pubs, public parks and general recreational areas – largely due to the unique, attractive design with a solid construction throughout. That’s why we’re offering the above saving when you buy five. 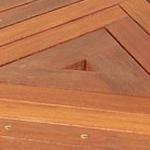 Constructed using Merbau Hardwood, a very hard-wearing timber with a lovely reddish-brown colour to it. The thick triangular top looks stunning and is highly practical as well. Merbau Hardwood is often used in wooden floors due to its hardwearing nature and natural resistance to rot and insect attack. This makes our triangular picnic tables second to no other for quality and you can rest assured they’ll stand up to the rigours of regular commercial use for years. The seats themselves will seat up to six people comfortably. The chunky legs are thickly set with a solid, bolted construction – a combination that makes it extremely unlikely to develop an annoying wobble with regular use. There is also a hole in the middle of the table top for a parasol to be added if required. If you have further questions please speak with our friendly Sales Team in the Midlands. I purchased these to go outside our restaurant, they are great value for money and look great. Ordering was a simple process, I would recommend you to anyone, thank you very much.